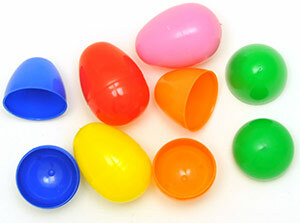 An 18-year-old Pennsylvania teenager was charged Saturday with harboring a "weapon of mass destruction" after igniting what looked to be a plastic Easter egg filled with plastic pellets inside a flea market. According to a local report, police said the explosion hit at least five people and set off a building alarm. "Michael A. Camp, 18, of the first block of Cedar Manor, was in the main area of the flea market shortly before 1 p.m. when he pulled out a lighter and lit the device," state police told the Patriot News. "It exploded, shooting the pellets in the building and striking numerous people, police said." "The device looked like a plastic Easter egg with a firecracker inside," Peggy Beckley, the market's vendor manager, told the News. She added that the pellets looked like those used for an air gun. "He didn't say a thing," Beckley said. "He came in, lit it and then ran." The teenager surrendered after employees chased him into a parking lot and stopped him from getting into a car. Authorities charged him with possessing a WMD, recklessly endangering others, disorderly conduct and assault. "He was with a group, but he was the only one to come in," Beckley told the paper. "I'm sure it was a prank."